The Pratt County Sheriff’s Office along with the help of the Pratt County Emergency Services and Pratt County Rescue responded to an accident Tuesday afternoon at the intersection of NE 60th and NE 70 Ave.
Officers found a 2005 tanker truck on its side north of the intersection in the right ditch and also found a 2011 Ford F-250 also in the north right ditch. 65-year-old William Blomander of Ulysses crawled from the cab of the tanker truck and was taken to Pratt Regional Medical Center to be treated for non-life threatening injuries. 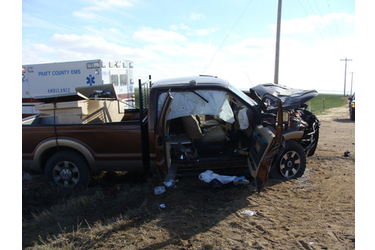 65-year-old Donald Fisher of Preston had to be extricated from the F-250 and was taken by helicopter to the Hutchinson hospital in critical condition. The tanker was headed northbound and the pickup was eastbound. Pratt County Sheriff’s Office investigated.